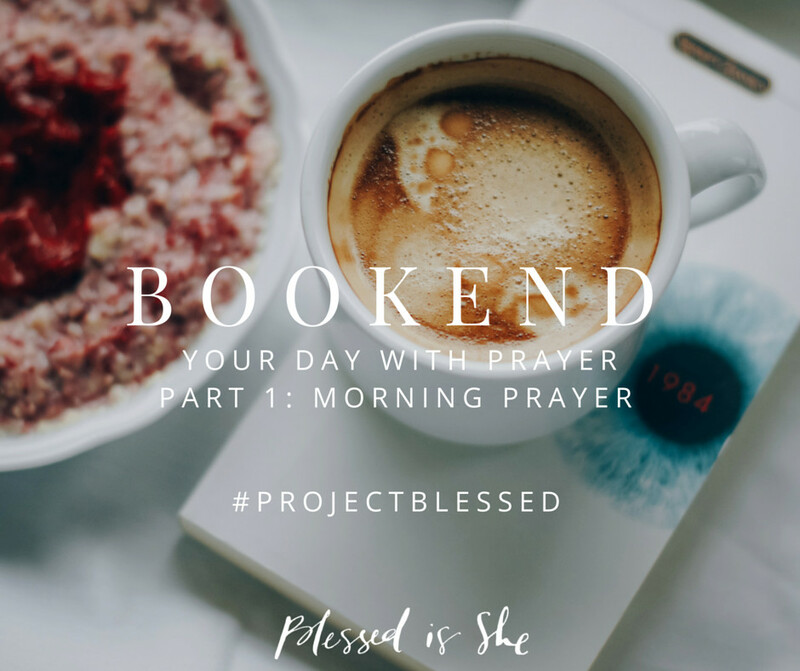 Today and tomorrow, Bobbi Rol of Revolution of Love is sharing posts about how she bookends her day with prayer. Today — morning prayer and what it looks like for her as a wife and mother. As I mentioned previously, I was thinking about how I have been dissatisfied with my morning routines lately. I was reading Chaos to Calm: Week 1 over at Her Southern Charm Blog. I could relate to Jennifer’s words and clicked onto the Bible study she was reading over at A Virtuous Woman.org. I read about Melissa Ringstaff, a preacher’s wife, and was was intrigued by her study. Originally I was going to skip it because Melissa is not Catholic and she wouldn’t be able to offer advice from a Catholic perspective. However, while she does not discuss Jesus in the Eucharist or asking Our Lady for prayer, she does make some beautiful yet practical points about being a virtuous Christ-like woman and they were truly speaking to my heart. So I continued with the study and just added my own Catholic materials to supplement. Here are a few points that really hit home during Week 1. 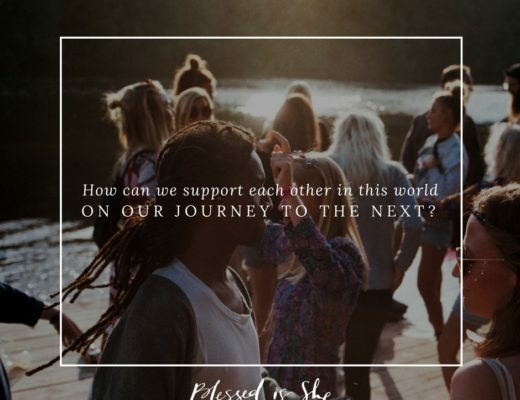 As women striving to seek out God’s will for our own lives, is so important that we wake in the morning and humble ourselves before Him and ask Him to give us the strength we need to get through the day. So, this week’s challenge is having a morning prayer and devotion. I do believe that the morning is the best time of the day to get yourself in order. Just as our homes need organizing and maintaining, our hearts need order and maintenance as well. Morning is the best time for getting to know God. This principle was deeply impressed upon the children of Israel by His daily gift of manna. The angel food cake rained down from heaven early in the morning, six days a week, for 40 years. If one waited too long to gather it, the manna would evaporate in the heat of the sun. “And they gathered it every morning, every man according to his eating: and when the sun waxed hot, it melted.” Exodus 16:21. Likewise, if we wait too long for our spiritual devotions, the cares and pressures of the day will get our attention before the Lord does. 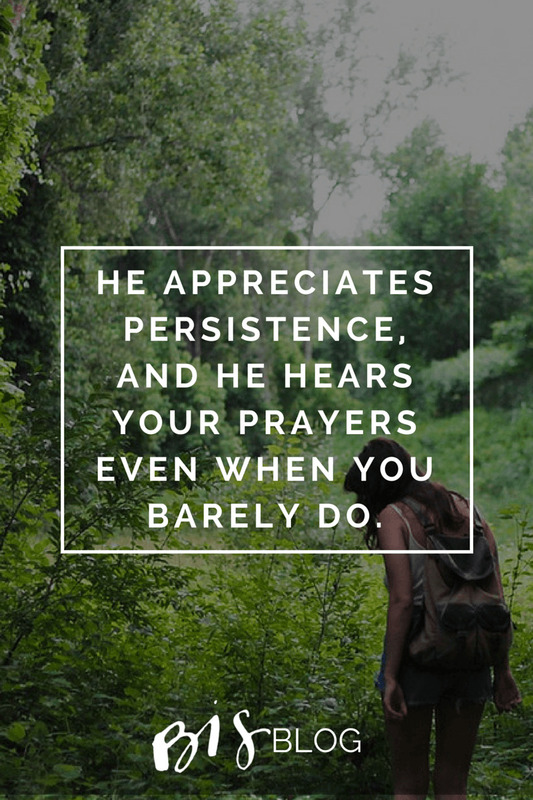 The busier we are and the more we have to do, the more we need to take time to pray. Let’s not allow the manna to melt. An excellent point. So I’ll keep trying to gather up my “manna” in the morning. Women have the power to change the atmosphere in their homes. I am sure you have heard the saying, “If mama ain’t happy, ain’t nobody happy!” If you wake up each morning feeling ill, unpleasant, expecting the worst, dreading your chores, irritated with your husband, or tired of training your children, you set yourself up (as well as your husband and children) for a bad day. Ask God for wisdom in dealing with your everyday circumstances. And choose to be happy. Do not allow other people, uncontrollable events, or lack of material possessions influence your choice to be happy in the Lord. Have you ever seen a child who was terminally ill? Or a person who was unable to care themselves, who in all their pain and suffering still had joy in their hearts? You can be like that too. Whether you wish the laundry would go away or the bathrooms would clean themselves or your children would stop bickering you can still be happy. It is a blessing to have clothing for your family. It is a blessing to have a home with indoor plumbing. It is a blessing to have children. Stop looking at them like they are a curse! Choose to be happy! I like that phrase – you can choose to be happy. It reminds me of marriage itself. Once the honeymoon is over and all the warm feelings are replaced with reality, the marriage can slip away unless you choose to love and to make it work despite the difficulties. It takes effort to keep the “honeymoon” alive. My vocation as a wife and mother is the path God has chosen for me to work out my salvation. Of course it is not going to be all daisies and sunshine. There is a lot of “manure” (trying to keep this PG) that has to be dealt with but from the occasional stench comes a beautiful garden. And the more I learn to stop being so selfish and self-centered, the more I can see my blessings. Dirty laundry = warm clothes to wear. Dirty dishes = we had food to eat. A messy house to clean = a roof over our head. Rambunctious kids = healthy kids with lots of hugs and kisses to share. Beds to make = Loved ones sleeping in their beds and not in the hospital or worse. It’s all in the attitude and how you look at things. I must admit that while I am mostly cheerful, when I am upset I hate acting cheerful. I feel like a fake Pollyanna. How am I supposed to be cheerful then? The circumstances hadn’t changed, it was still chaotic but I was able to work through it, by God’s grace, and be at peace with the fact that life with kids is not always um…peaceful. There will be chaos. However, from that chaos, I can find calm – in how I handle it and by working on some of the elements that add to the chaos. If my hope and trust is in the Lord, then there is certainly a natural joy that comes from the grace of God in my life. It is not fake. If God is the source, it doesn’t get more genuine than that. Later that day I stepped back and thought, “Hey, this prayer thing really works! I can see God’s hand helping me.” And then again I thought, “And how many times has God already taught me this lesson?? Am I that hard headed that he has to keep reteaching me? ?” Obviously, yes. Point 3: With Joy Comes Peace. Today I want you to think about peace. What does peace mean to you? It is so important to have peace in your home. If your husband comes home each evening to peace, he will look forward to coming home. 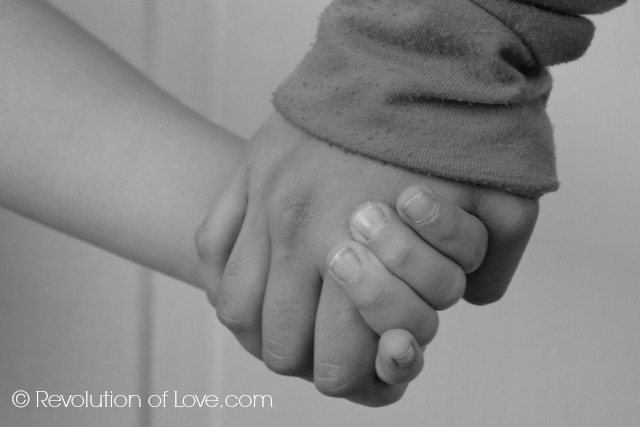 If your children live in a peaceful environment, they will grow up to care for the feelings and needs of others rather than be anxious and unsure of themselves. How do we attain perfect peace? The Bible says we will have peace from God if our thoughts dwell on the things of God. Our hearts will be transformed. This is why having your morning devotion is so important! It sets the tone for the rest of the day. If you begin your day consumed by the Word of God, your heart will have been recharged or nourished by the bread of life. Your emotions will not be running on an empty tank. Again, morning prayer. I am seeing more and more how important it is. If I am unable to go to Mass, I am trying to make sure I do a spiritual communion instead. 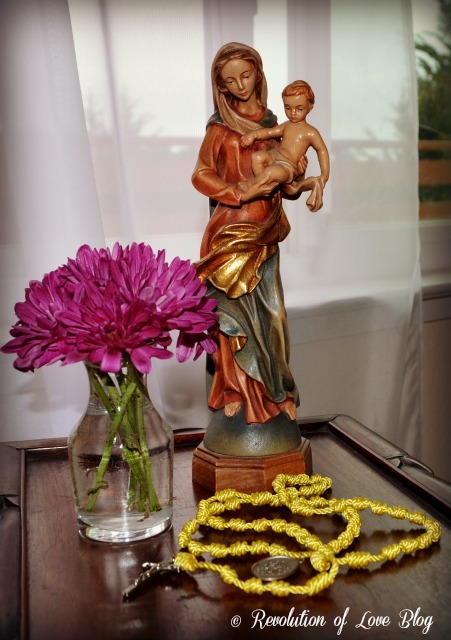 The rosary (even just a decade) is also a great source of peace and strength. If you already feel like your heart reserves have been running on low for quite some time – you need to fall on your knees before the Lord and pour out your heart to Him. Let the tears flow! Cry out to Him – out loud! He is there for you, always waiting for you. It is okay to tell him you feel lousy and that you know you messed everything up and that you are desperate for His help. ASK him for that perfect peace. Sometimes life doesn’t go the way we want or expect. Sometimes we have so much hurt and sorrow that we don’t know what to do. Those are the times we most need our God. Turn to Him in your pain and sorrow, He is faithful to help you and you will learn much about HIM as well as yourself. I would also add the importance of frequent confession, at least once a month. We need the grace of confession. In humbling ourselves before God we are the ones that receive the blessings of grace, healing, comfort and strength. For me, I can physically feel when my confessional graces are running low and I need to spiritually recharge. I have a set day (the 2nd Saturday of the month) and I mark it on the family calendar and don’t change it unless absolutely necessary, in which case, I go the following week so I won’t let the weeks slip away. I think that brings me to my favorite point so far. Point 4 – God’s Mercy Gives Us A Fresh Start. We receive new mercies every morning. I love that image of starting new. It does not mater how bad we messed up the day before or in the past, God is always willing to give his prodigal daughter a second chance. Little by little, day by day, he forms us and molds us into daughters of the King. 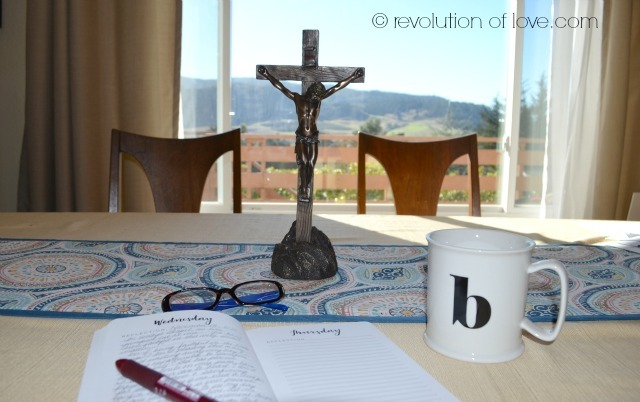 Have you explored morning prayer in your day? If so, what does it look like for you? If not, how can you begin to integrate it into your day? I’ve been committed to a morning prayer time for quite a while. I do feel the difference when I skip or skip it. Although some days . . . This morning the screaming reached my quiet prayer time . . . And it went downhill from there. The points about choosing joy and peace and constantly asking for help are good reminders for me, especially for today. As soon as I wake up , I thank God for another day and ask Him for the necessary strengths and graces. I think this week I’ll make my morning prayer more meaningful by praying for the intentions of others. I am not a morning person at all, but I started getting up at 6 am last week when my husband started a new job and has to leave by 6:30. Having quiet time alone in the morning was beautiful and fruitful! I did my BIS devotion and a novena first thing and I definitely noticed a peace that I’d not had when I was waiting until the kids woke me up! This morning I didn’t get it in because all the kids decided to get up at 6 as well, but I’m hoping to get back to it tomorrow morning.